If there’s one thing to bring us together as a species, it’s the delight we feel in a sharable and relatable experience. Car people in Lesotho have the same desire to see interesting automobiles drive fast as those in Gordonsville or even in Beirut. A secondary common experience might be the secret enjoyment many feel when watching rich people bend their pricey cars. 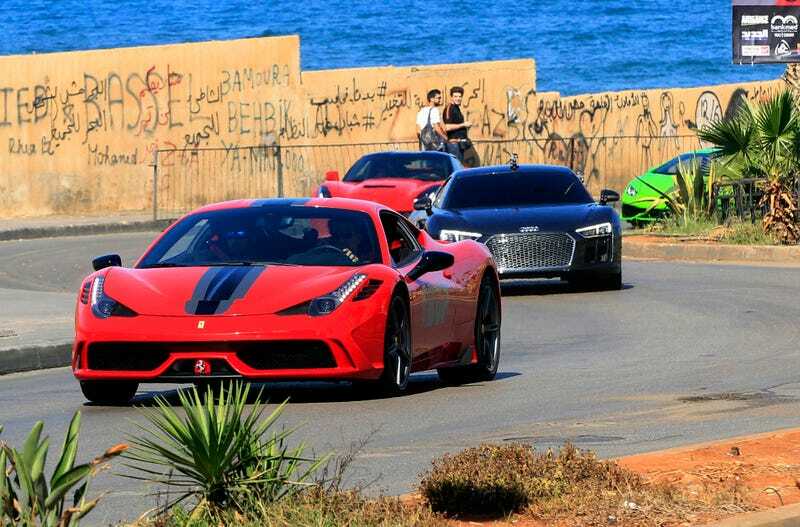 Beirut held its first ever Beirut Grand Prix, and while it wasn’t a F1 race, it did see non-professional exotic car owners from across the region putting their personal vehicles on the track for a variety of competitions including a drag race and a road circuit. While I haven’t been able to find any video of drag racing snafus, both a Ferrari 458 Speciale and a Ferrari F12 managed to eat it, the former thanks to too much oversteer and the later due to what looks like late braking. Honestly, I don’t have a problem with this. This part of the world isn’t exactly stuffed with racing courses like you’d find in the United States or Western Europe and everyone here is participating in a sanctioned event with what looks like an attempt to keep spectators and drivers safe. Ultimately, the competition was won by a guy in an Audi R8.